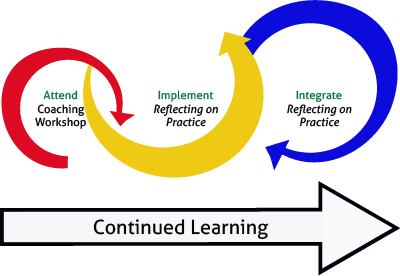 Reflecting on Practice is intended for institutional adoption. RoP Facilitators at your institution implement the program over time, with staff and volunteers. Reflecting on Practice Coaching Workshops are professional learning experiences that teach workshop participants how to lead the Reflecting on Practice program at their own institutions. Coaching Workshop participants become RoP Facilitators, and continue their own learning as they facilitate the program for colleagues back at their institution. Coaching Workshops are led by RoP Leaders in six regions around the U.S., and bring together educational professionals from many types of informal STEM learning institutions. connect with other RoP Facilitators from around the country. Following the Coaching Workshop, RoP Facilitators implement the program with educators at their institution, at their own pace, over a period of 6 to 12 months, continuing to broaden their own practice as they go through the program with colleagues. Reflecting on Practice is designed so that all educators (veteran and beginning, full-time and part-time, seasonal and career) within an institution can learn together and from one another. RoP Facilitators become part of a field-wide community of educators advancing the role and excellence of informal science education. This community not only fosters common language and effective practices in the field of informal science learning, but also serves as a mutual support system for all facilitators throughout their careers.